After all the heavy and rich foods of the holidays, I’m ready to start eating lighter and healthier to start the year off right. 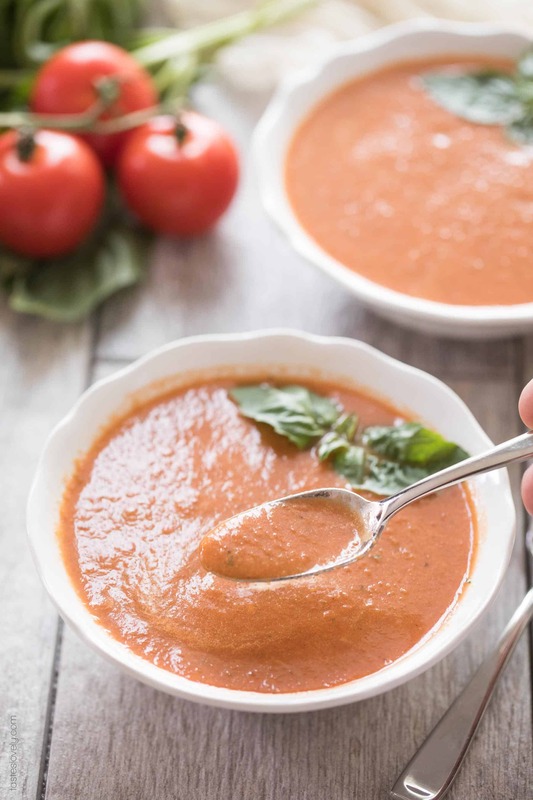 We’re doing a Whole30 in our house this January, and this paleo and Whole30 Tomato Basil Soup recipe is the perfect lunch or dinner that I know I’ll be making all month. I love this tomato soup because of how clean it is! All real ingredients, and most importantly no dairy. 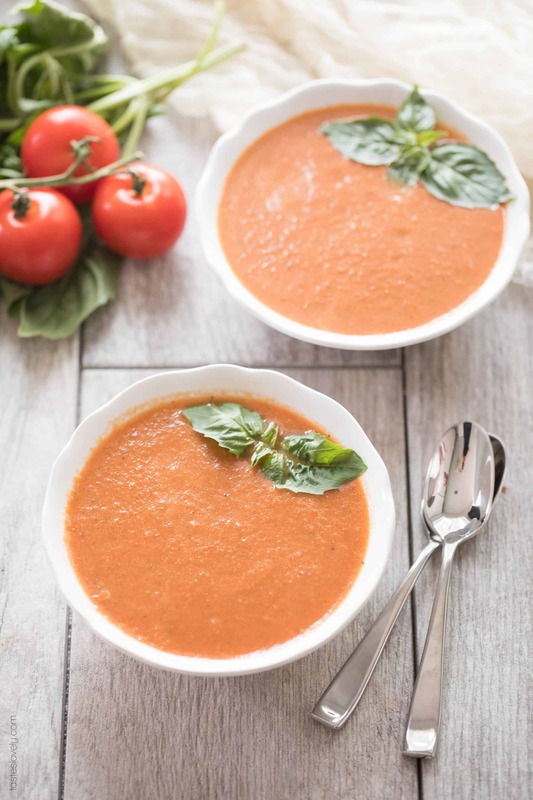 Most tomato soups are packed with butter and cream, but this one is made with just tomatoes, onions, garlic, chicken stock, olive oil, fresh basil, and a little coconut milk to add some dairy free creaminess. The best part of this soup is how fast it comes together! It is ready in just 15 minutes, start to finish. I know. Seriously. Your blender does most of the work for you. You soften the onions in the pan, then blend everything up in your blender and return it to the soup pot to warm it up. 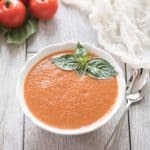 Since tomatoes aren’t in season in January, I love using canned tomatoes to make this paleo & whole30 tomato basil soup. You want to get really high quality tomatoes, since this soup is only going to be as good as your tomatoes. My very favorite canned tomatoes to use are whole, peeled San Marzano tomatoes. You can buy them at any grocery store, even Trader Joe’s and Costco! 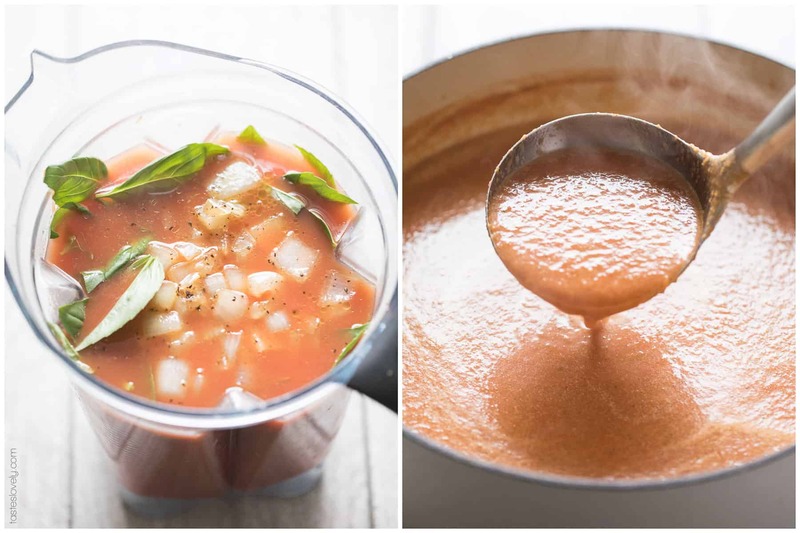 You’re going to love how simple and tomato forward this soup is. And you’re especially going to love how healthy it is! Paleo, Whole30, dairy free, gluten free, grain free, sugar free and clean eating. 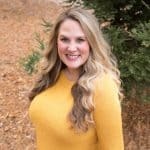 I’ll be sharing delicious and satisfying Whole30 all January long! If you want more Whole30 recipe inspiration, I have got tons of Whole30 recipes for you to enjoy! In a soup pot over medium heat, add the olive oil and sauté the onions, garlic, salt and pepper until the onions are soft and translucent, about 5-8 minutes. In a blender (I love my Vitamix! ), combine the canned tomatoes, basil leaves, sautéed onions and garlic, and stock. Blend over medium low speed until combined, about 1 minute. Pour the soup from the blender back into the soup pot. Add the coconut milk. Warm over medium heat for 5 minutes. Taste for salt and pepper and add more if desired. Serve warm topped with fresh basil leaves. 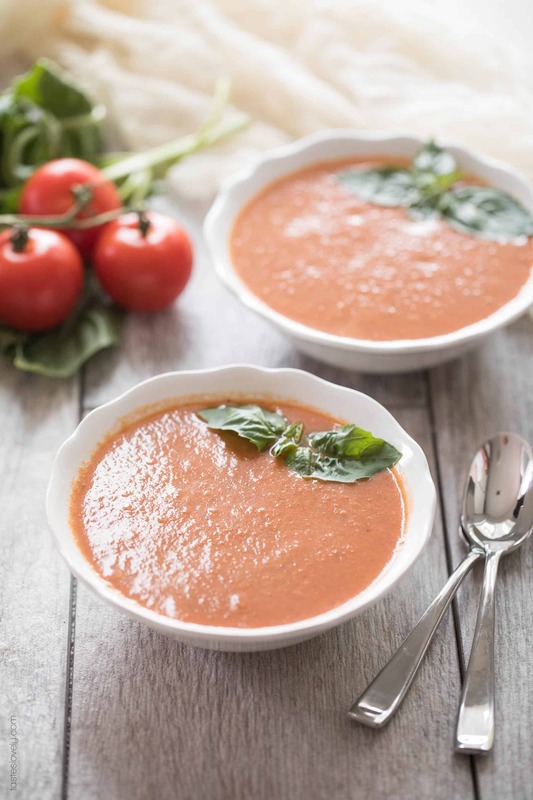 The soup is only as good as your canned tomatoes! My very favorite are San Marzano. I LOVE this recipe. I’ve made it a couple of times now and am planning on making it again tomorrow for a church function, so many people will get to try it :) I’m so excited. I only have one concern/question….I had screenshot the recipe before and now I notice there’s a difference between that and what’s on the website now. The tomatos-are we really supposed to use 2 cans of the tomatoes? It seemed just fine with one last time I made it. Super yummy soup! I love that I can use canned tomatoes too. 5 stars! 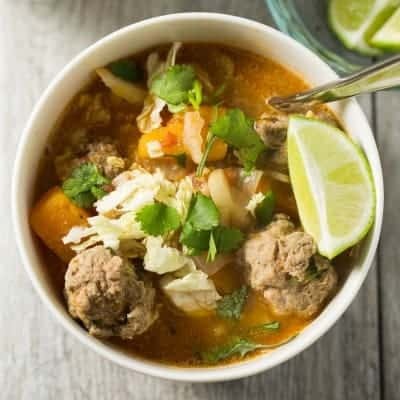 This soup is delicious and so easy. I was concerned about the coconut milk because I thought it might overpower the tomato, but I figured I’d follow the recipe and see. The coconut was not at all prominent but it added the beautiful creaminess you want. YUMMMM my kids ate it up too with grilled cheese sandwiches, which unfortunately I had to pass on. Thank you for this great simple recipe! I’m so happy you and your kids loved it! Makes me so happy to hear that! You just made my DAY! Thanks for taking the time to let me know you liked my recipe. Big hugs! 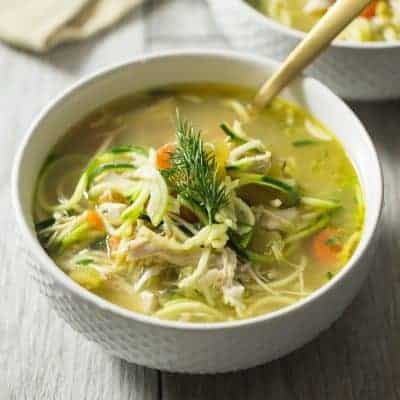 My family loved this soup! I had crushed tomatoes on hand, so that’s what we used, and my daughter made the recipe by herself (so, good directions!). Thank you so much for the recipe! I’m so happy to hear that! Thanks Christine! And crushed tomatoes work too. Love that your daughter helped you make it! Thank you, thank you, thank you! I am 7 weeks pregnant and struggling to find food to eat. 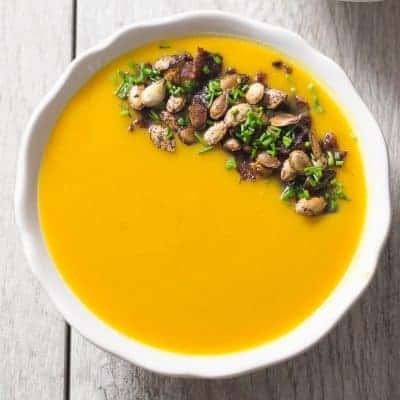 This soup was amazing and made me feel great. I plan to live off of it for a few weeks! My picky husband really enjoyed it too. Oh hugs momma! Weeks 7-12 are ROUGH! Don’t worry, soon food will sound amazing again. So glad this soup is helping you out! This is actually perfect for those early weeks. Very gentle on the stomach. Good luck with your pregnancy! Thanks for making my recipe and letting me know you liked it. You made my day! We are eating it right now!! Love the recipe! Do you know how many calories it contains? I’m so glad you liked it Leann! Thanks for letting me know. I calculate all Calories on Myfitnesspal.com! Made tonight, fabulous! Thank you! I’m so glad to hear you liked it Kaye! Yea! Thanks for taking the time to let me know. You made my day! So easy, I made for lunch for my parents they never knew it was whole 30! I’m so glad you and your parents liked it Cynde! Thanks for taking the time to let me know! Isn’t this such a great and fast lunch? Appreciate you sharing kindness and positivity with me! Rooting for you and your health journey.